1985, 1948, 1949. 684 p.
Can I just declare at the outset that I loved reading this? I found myself looking forward to bed and being able to put aside all the ‘proper’ reading that I’m supposed to be doing and just plunging myself into the domestic lives of Mumma and Hughie, Roie and Dolour. I had read the second book of the trilogy several decades ago (oh dear, fancy being old enough to be able to make a such a declaration!) but I came back to the book because it was a selection in my online Australian Literature bookgroup. The scheduled read was ‘Missus’, which is chronologically first in the trilogy, but was actually written almost forty years after the second and third books. Stylistically, ‘Missus’ is a very different book, covering a much wider time span and more in the style of ‘sweeping family saga’ with its multiple generations and incorporation of historical themes. 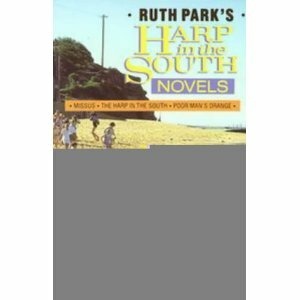 ‘The Harp in the South’ and ‘Poor Man’s Orange’ are far more domestic and limited in scope. They are limited in geography too, for the focus very much revolves around Coronation Street, Surry Hills and the neighbours, shopkeepers, and local personalities of a small constellation of city streets. Had I not known that it was written in the 1940s, I would have said that it was a television tie-in, as the chapters are quite episodic in nature; perhaps its construction was influenced by radio serials as a writing genre. For me (partial as I am to the domestic drama), the books worked at an emotional level: these are flawed, thwarted but fundamentally good people doing the best they can. At times there was a discordant, omniscient authorial commentary which made me uncomfortable with its patronizing tone, and I didn’t like to think of the author ‘looking down’ on these people as examples of a socio-economic ‘type’. I much preferred it when the author allowed her love for the characters to come through. I was impressed that in the second book, which was written first, situations were set up that allowed Park to return to them in the prequel all those decades later. Was it planned that way?- if so, what foresight! As it was, I am pleased that she chose to finish where she did and return to the prequel. ‘Poor Man’s Orange’ closes with an awareness that the slum neighbourhood of Surry Hills is about to be transformed, and somehow a continuation of the book into the government housing projects of the western suburbs doesn’t have much appeal. This is good, solid story-telling, with none of the rather precious self-consciousness of 21st century writing. It rings true in its dialogue and in the development of character, and as a reader I was able to just relax into the hands of a confident author, sure of her craft. What a co-incidence. While looking at YouTube vids of Sydney trams today, I watched a clip from Poor Man’s Orange. I read both books a long time ago and I can’t remember them now. I know I enjoyed them though. It is nice to read for pure pleasure at times. Ain’t that the truth! I hadn’t thought of looking on YouTube for clips from the television mini-series. I don’t know whether I want to see it, or whether it would be disappointing after enjoying the books so much. Hi Janine, I read Harp in the South last year but I haven’t read the other two (though I have read her autobiography). I’m interested to see that you thought Park was patronising her characters from time to time. She was as poor as a churchmouse herself when she lived in the slums – do you think she was looking down on the ones who (e.g. because of drinking problems) didn’t try to improve their lot, or was it something else? I can’t find another one, and it didn’t happen often which is why is stood out to me. It also seemed rather abstract, after her close depiction of their inner lives, to speak of them as “those people” or “they”.